On August 3 Lewis and Clark held a council with the Oto and Missouria Indians at a site they named "Council Bluff," near present Fort Calhoun, Nebraska. It was the first of many councils they would hold on their journey to the Pacific Ocean. Following the council, the explorers moved upriver, camping south of today's community of Blair. Besides describing the council, Clark's journal notes the merits of "Council Bluff" as a location for "a Trading establishment & fortification." In 1819 the army established Fort Atkinson. From the Indians and "Mr. Faufong, the interpeter," they learned that it was a 25-day journey to Santa Fe. On August 4 the party camped at a site north of Blair. Clark was concerned over the disappearance of Private Moses B. Reed. Reed had asked permission to return to the previous night's camp to get a knife he left behind, but it was only a pretext to desert. He was captured two weeks later and dishonorably discharged from the army. 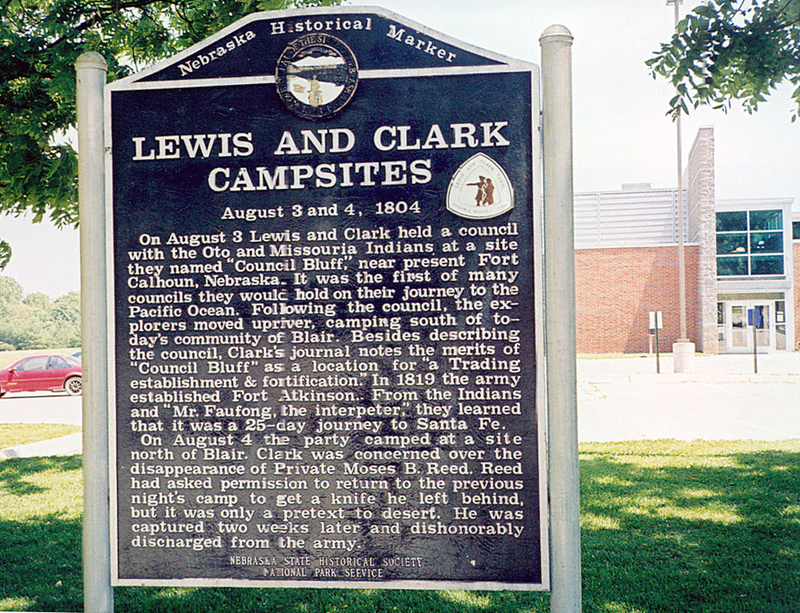 “Lewis and Clark Camp Site: Aug 3 - 4, 1804,” Explore Nebraska History, accessed April 18, 2019, https://mynehistory.com/items/show/518.